Pallets boards not only contain the simple straight or thing wooden lengths they also contain the thicker square shaped blocks which can also be recycled in number of ways! 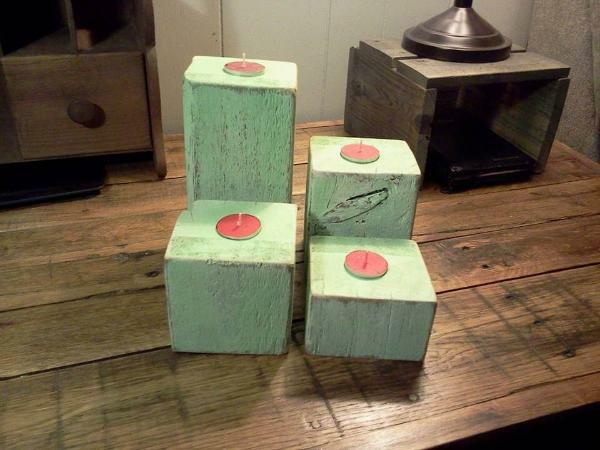 Repurpose these thicker pallet blocks to creative something very innovative and functional just like these pallet candle holders or votives, self-made and painted for a custom look! Cut some wood out from a pallet block and create a circular hold and cavity inside! Just fill up the wax inside or fit the tiny tea lights inside of those cavities to get instant votives for home decors and also for your coffee tables or dining table! Using different paint shapes and different colors of wax you can give amazing variations to these pallet-made candle lights! 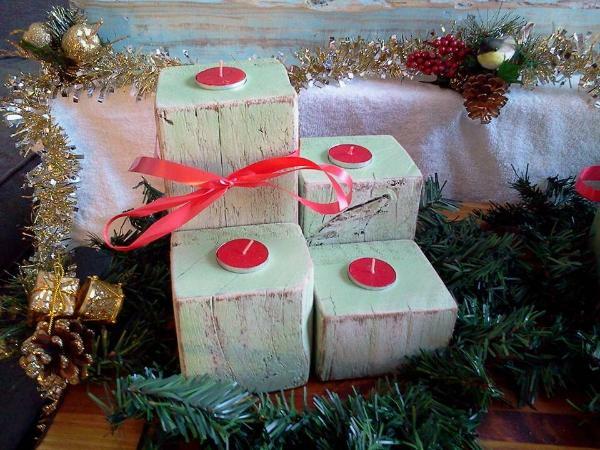 One can also fasten the twine to them or gift bows make beautiful gifts out of these pallet candle holders! Also use the glitter, printer paper covers and some stencil pattern to give create a more enchanting look of these votives! pallet wood comes in many shapes and sizes to be recycled and enjoyed its multiple benefits for the different possessions. 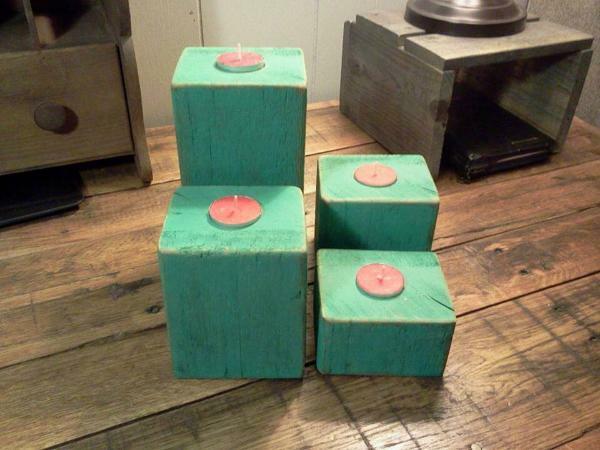 IF you find some pallet blocks near by don’t let the get wasted as you can achieve these gorgeous pallet candle holders out of them. Fill the middle part of the blocks with candle wax or you just can put a small candle on it to make these whimsical light pieces to enhance the decor and aroma of your dining and coffee tables. You are always availed with an option to stain and paint the items with your own favorite choice of stains. same is the case with these candle holders paint them with exciting hues to make them a part of your decor.